Australian cricket legend Steve Waugh once said: "Fail to prepare, prepare to fail." Many holiday-making novice skiers are failing to heed Waugh's maxim, a new survey suggests - and sometimes with painful consequences. More than four in 10 (43%) beginners polled in Snozone's Ski Holiday Satisfaction Survey wished they had taken extra skiing lessons before hitting the pistes in the Alps or the Pyrenees. Learning to ski can be a painful experience involving plenty of bumps and bangs to both body and ego. But learning at a resort can also be expensive. Novice skiers lose up to three days of their holiday learning the fundamentals of the pastime and spend up to £300 on lessons, according to the poll undertaken by the indoor ski-slope company. The figures are a reminder of the potential pitfalls of a skiing holiday, and offer a timely reminder of the importance of taking out sports travel insurance for extra peace of mind if you're hitting the slopes as a beginner - or even an intermediate - skier. It questioned 2,220 UK residents who have been on a skiing holiday in the past five years. The cost of resort lessons adds £200-£300, the poll found, in addition to the £750 to £1,000 that British travellers expect to spend on their skiing holiday. More those half of those surveyed (55%) also admitted to novice nerves, claiming that skiing can be a frightening thought for people inexperienced in the sport. 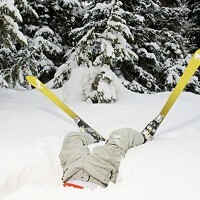 Nearly half of people questioned (46%) claimed they go on a winter sports holiday every year. A bit of ski practice before you board a plane to France can make all the difference, says Snozone's Elena Kale. She said: "For complete beginners, learning to ski or snowboard can be an intimidating experience." So, she advised, lessons before you leave should give confidence to make the first few days of your trip much more enjoyable.